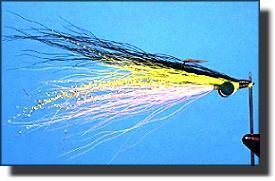 The Clouser Minnow is perhaps the most effective streamer fly of all time. It catches anything that will eat a minnow. In fact, it usually out-fishes any other streamer pattern you might have hidden in your fly box. Aside from the common jig, it is likely the most productive single lure of all time. 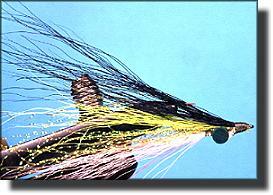 For that, we need to thank Bob Clouser for his inventive mind and this great fly. I believe a Clouser Minnow will catch anything that opens its mouth. To date, I've caught three kinds of bass, walleyes, northern pike, tiger musky, five types of trout, two types of catfish, carp, crappie, perch, bluegills and sunfish on the fly. I also had the luck to catch a few unnamed saltwater fish and something called a surf-perch when I had the rare chance to try it in saltwater. Can you name another fly that's versatile enough to catch more species of fish? 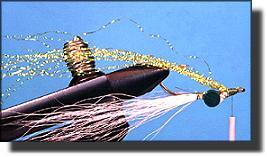 I think the greatest feature of the Clouser Minnow is the way the barbell eyes cause the fly to "swim" in the water. You have some control over this motion by having control over where you place the eyes. Move them forward toward the hook eye and it swims more like a jig. Move them back toward the hook bend, and it glides through the water. Traditionally, the eyes are tied to the hook about 1/3 of the hook shank back from the hook eye. 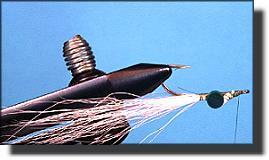 This causes the fly to swim similar to a jig with a slight sliding motion. When I tie the fly for chasing crappie, I usually move the eyes to about 1/4 of the hook shank back from the hook eye. 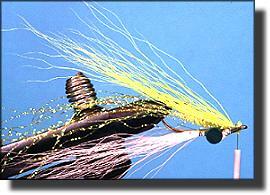 This causes the fly to dip and dive very much like a traditional crappie jig. For smallmouth bass, I often tie in the eyes between 1/3 and 1/2 the hook shank back from the hook eye to create a sliding motion smallmouth bass just can't resist. Another feature of the Clouser Minnow is the way the fly swims with the hook point up instead of the traditional downward look. This makes the fly virtually weedless so it can be used in heavy cover where many predator fish lurk. It also does a pretty good job of bouncing over rocks without hanging up or damaging the point of the hook. 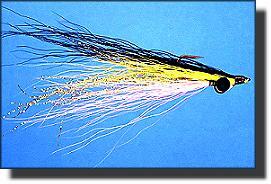 For those folks who don't believe walleyes can be caught on a fly, they just don't know the value of a Clouser Minnow. This is one of the most productive walleye lures ever invented. Fished in the shallows in spring and fall, it often out-fishes more traditional lures and baits. Fished off rocky points and drop-offs during the hot days of summer, it's often just the thing big walleyes are looking for. If you look closely at minnows and other water critters like crayfish, you'll notice that the underside of these creatures is lighter in color than the top. It's important to consider this fact when you place the materials on the hook. Since this fly swims with the hook point up, the lighter materials are placed on the opposite side of the hook shank from the point. This is exactly the opposite from the way most streamers are tied. Although I could probably consume a few more pages of text describing the virtues of the Clouser Minnow, I think I'll let you find out for yourself instead. Let's get started. 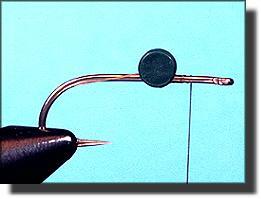 Hook: Mustad 3407, Tiemco 811S or equivalent. Sizes 2/0 to 10. Thread: 3/0 monocord, color to match body or create desired effect. Body: A mix of bucktail, synthetic hair, crystal flash, flashabou and many other possible things, color to match the natural you want to match. Angler's Choice non-toxic hourglass eyes, lead barbell eyes, bead-chain eyes or any similar eyes that add weight. 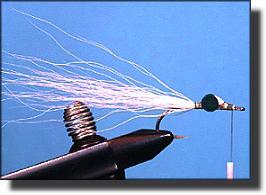 2.Tie the lightest hair or material you're planning on using (in this case white bucktail) first behind the hook eye, then behind the eyes as shown. The hair should be pulled tight between the eyes before it's finally secured. 3. Remove the hook from the vise, turn it over and place it back in the vise with the point up. 5. Add another patch of hair in the desired color; again, behind the hook eye. 7. When pulled through the water, the hook should ride with the point up like this. One final note; you're probably going to need a lot of these flies so tie up some sturdy spares. If you try them on trout or bass, be sure to hang onto your rod real tight. The fish get pretty savage when they try to eat this fly.